One of the many advantes of distance fields, is that they naturally provide global information. This means that when shading a point, one can easily explore the surrounding geometry by simply querying the distanve funcion. Unlike in a classic rasterizer (REYES or scaline based), where one has to bake the global data somehow as a preprocess for later consumtion (in a shadowmap, depthmap, pointcloud...), or in a raytracer where finding global information must be done by sampling the geometry by raycasting, in a distance field the information is ready for use at shading time, pretty much for free ("free" with many quotes of course). 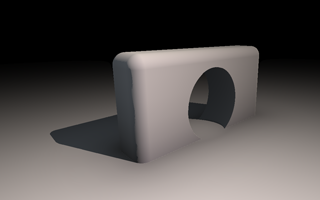 This means that many of the more realistic shading and ilumination techniques are easy to implement with distance fields. And this is even more true when sampling/rendering distance fields with a raymarcher. 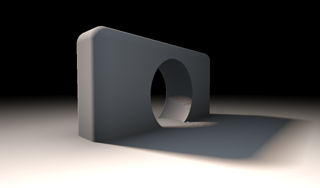 In this article we are going to exploit this nice properties to render soft shadows with penumbra, for free, when doing raymarching based rendering. This code works beautifully, and produces nice and accurate sharp shadows, as seen in the top-rightmost image in the articles. Now, we can add only one line of code and make this look much better. The trick is to think what happens when a shadow ray doesn't hit any object, but was just pretty close to do so. Then, perhaps, you want to put that point you are shading under penumbra. Probably, the closest your point was to hit an object, the darker you want to make it. Also, the closest this happened from the point you are shading, the darker too. 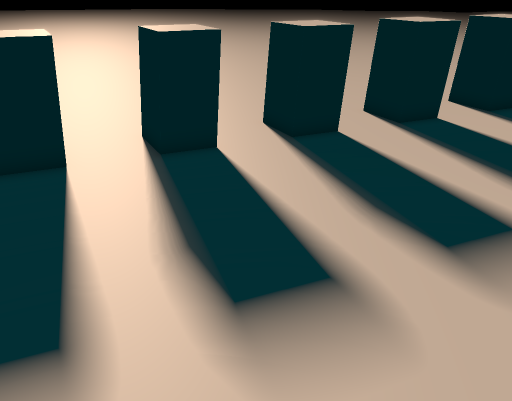 Well, it happens that as we raymarched our shadow ray, both these distances where available to us! Of course he first one is h in the code above, and the second one is t. So, we can simply compute a penumbra factor for every step point in our marching process and take the darkest of all penumbras. This simple modification is enough to generate the much nicer left image in the begining of this page. 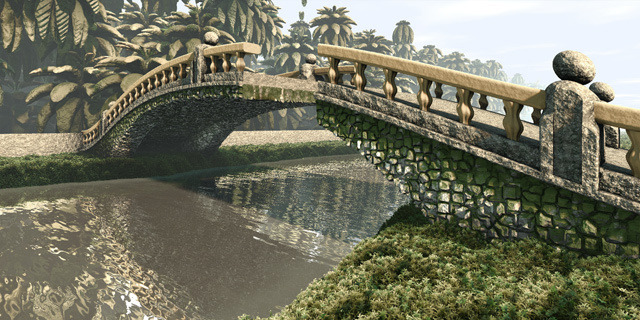 As you can see, the improvement is massive: not only you get soft shadows, but they even behave realistically as when shadows are sharp next to ocluder and ocludee contact (see where the bridge touches the floor) and much softer penumbras when the ocluder is far from the ocluded point. This, at the cost of one division per marching point, which represents a zero cost relative to the evaluation of map(). 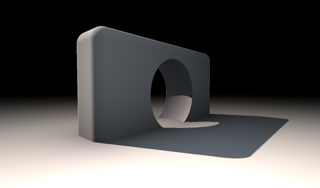 Of course, the k parameter in the function controls how hard/soft the shadows are. See images on the right of this text to compare the same shadow rendered with different values of k.
So, basically, if you can do classic raymarched shadows, you can do soft shadows with penumbras too. For free! 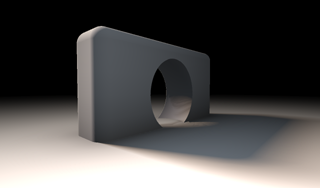 and you can see a lot more examples of this technique in action in the raymarching with signed distance fields article. 7 years after the publication of this technique, Sebastian Aaltonen published an improvement at his GDC presentation, that helps some of the banding artifacts you can get from this technique, especially for shadows from caster with sharp corners. The white arrow is the ray we are marching. The green dot is the current position along the ray, and the red dot is the previous position. 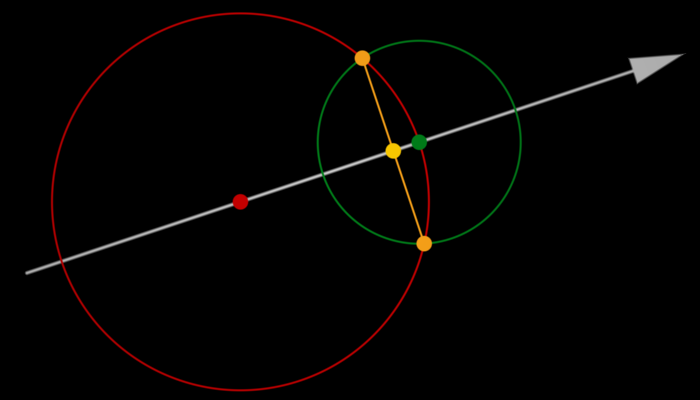 The green and red circles represent the current and previous SDF unbounding spheres. One can estimate that the closest surface will be at a point close to where these two spheres meet (yellow line and pair of dots). The closest point along the ray will be the intersection of that yellow area with the actual ray (yellow dot in the center).